Collectible 2015-W Proof American Platinum Eagles will go on sale Dec. 3 with a surprisingly reduced mintage, the United States Mint revealed earlier today. The U.S. Mint also announced that it would not produce a companion bullion edition "due to a lag in obtaining a sufficient quantity of production platinum blanks." 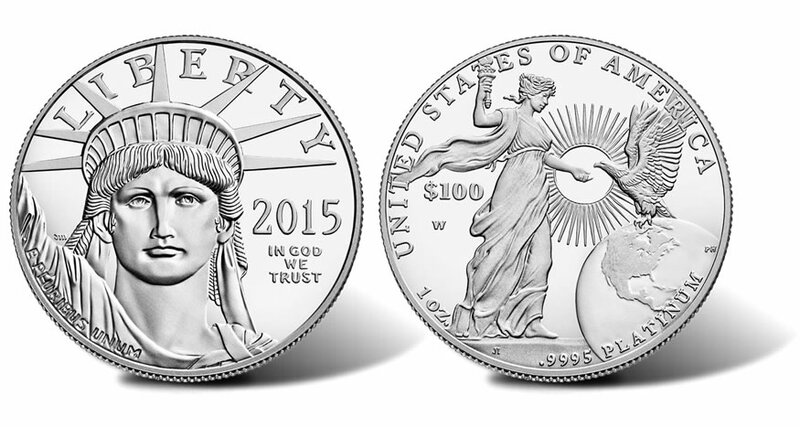 The 2015-W Proof American Platinum Eagle. Like past issues, it features a one-year-only reverse design. The struggle in acquiring those blanks has sharply trimmed this year’s proof Platinum Eagle mintage. It fell to 4,000 coins from last year’s announced limit of 15,000 coins. Collectors will have extra incentives to get the new proofs given their lower mintage, cheaper price and appealing design — the first in a new two-year series with reverse designs representative of the core values of liberty and freedom. The lack of a bullion option should also boost sales of the collectible. Last year’s proof Platinum Eagle opened with first week sales of 3,341 coins and ended at a new series low of 4,596 coins. It opened at a price of $1,650 — down $150 from the previous year. The bullion edition logged final sales of 16,900 coins. This year’s coin is listed for $1,250. By release time, it could drop to $1,200 with the latest declines in platinum prices. It’s actual launch price will be determined on Dec. 2 based on the latest weekly average of LBMA Platinum. "The United States Mint announced today that it would begin sales of the 2015 American Eagle Platinum Proof Coins on December 3, 2015. The mintage level of the 2015 Platinum proof coins is 4,000. In addition, the Mint announced that it will not produce 2015 Platinum Bullion coins this calendar year due to a lag in obtaining a sufficient quantity of production platinum blanks. The Mint sold 16,900 platinum bullion coins in 2014, the first time the coins had been offered since 2008. As the program moved forward to 2015, the Mint began the process of expanding its supply base for platinum, completing trial strike testing and full production validation with two new suppliers. These steps were completed in late October, and Mint officials decided to use the available blanks for the 2015 Torches of Liberty Proof coin program instead of the platinum bullion program. The Mint looks forward to resuming platinum bullion production at its West Point facility as additional blanks become available in 2016." 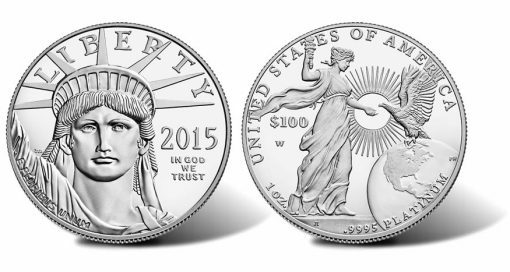 The U.S. Mint’s product page for the 2015-W Proof Platinum Eagle is right here. We’ll talk more about the coin closer to its Dec. 3 release. We’ll also throw our hat in the ring to try and get one to photograph. This very low mintage 2-year program, reverse proof coin will sell out in a matter of minutes. I hope to get the household limit of 1, before the quick sell out puts this coin into the ridiculous priced aftermarket !!! Several reasons to pick this baby up…. 2. (2) coin series.. Hopefully the 2nd coin is low mintage. 3. The low price in platinum. It won’t stay down forever. Yes, The $400.00 premium is a lot, But everybody who picks this one up is paying the same price. I don’t mind paying the premium as long as the coin is perfect. 4. The 4,000 mintage… Excellent in my opinion.. I stand corrected… a reverse proof design, not a reverse proof! Nevertheless, it will sell out quickly ! The Mint staff has finally learned from the past (an optimistic viewpoint). Keeping the mintage at the 4k level (blank issues aside) will guarantee this coin a sellout and assure that the value will appreciate. Thanks for the interesting, informative update on this beautiful platinum U.S. Mint coin. Considering the Mint only gave it’s customers an 8-day advance notice of it’s availability, & with a low mintage of 4,000 coins, i wonder if the Mint will do the right thing and place a 1-coin per household limit on this item (at least for the first day of sales)? Can you please use your Mint connections to find out if there will be a reasonable household limit or will they do another 50-coin limit (which favors dealers/investors/flippers) like the Mint did on the 2015 American Liberty High Relief gold coin? It appears to be the last of 2015. US Mint took down everything for the 2015 limited edition silver proof set. It had the LS4 item number, but now sits at “unavailable”. Can’t go wrong buying this coin. The Mint is not producing the bullion version due to a lag in obtaining a “sufficient quantity” …? Wha ..? They had the entire 2015 freaking year to obtain blanks (yeah gonna get a blank look from the Mint rep… ) talk about efficiency in ensuring the continued availability of the product for loyal collectors of Platinum … I guess there was no lag in anyone’s paycheck or promotions at the Mint though … this is the best way (by the Mint) to kill off enthusiasm for Platinum …. Seth, I recently spoke to the Mint on that issue about folks returning items back to the mint, especially proof gold items, And the representative told me that the U.S. Mint does not send out any coin(s) that have been returned by previous customers and those coins returned are destroyed melted down. Hey Joe#2, I wonder, who can you Really Trust anymore ?! This coin has a lot going for it, Beautiful design, lowest mintage of the entire platinum eagle 1 oz. proof series, first coin in a two year series and no bullion version. The mint finally did the right thing limiting it to one coin per household (limiting after market dealers hogging the website). They should do that more often. Even with the steep price premium, I believe this is a winner. Probably will sell out very quickly. Another example of Mint profiteering, no bullion, heck we cant give you a deal, $400 (33%) premium, what a crock, I will boycott & have the others but colleting coins per se is becoming a so what hobby, when WE die but for the precious metal value the # of real “collectors” will be quite finite…..